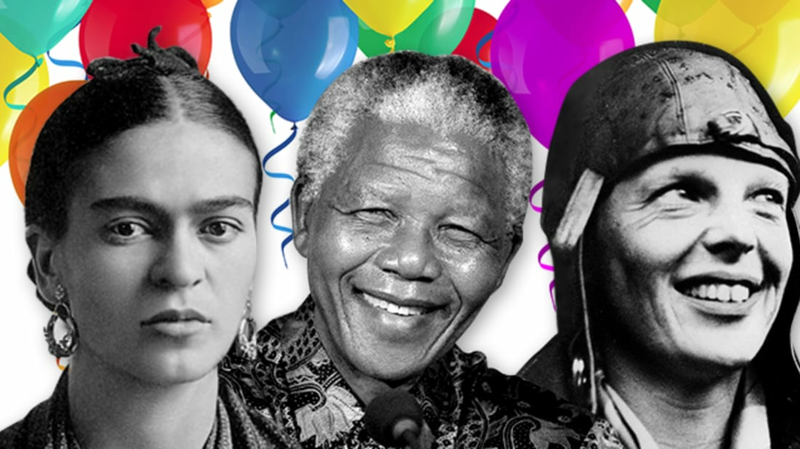 Some of our favorite historical figures were born in the month of July. We couldn't possibly name them all, but here are just a handful of lives we'll be celebrating. The famous research gorilla knows more than 1000 words of modified American Sign Language and loves cats. In 1984, she was allowed to choose a pet kitten from a litter for her 12th birthday, and she selected a tailless grey-and-white cat, which she named "All Ball." ("The cat was a Manx and looked like a ball," Ron Cohn, a biologist at the Gorilla Sanctuary, told The Los Angeles Times in 1985. "Koko likes to rhyme words in sign language.") Koko also “owned” a red kitty named Lips Lipstick and a gray feline named Smoky; the two animals were companions for nearly 20 years until Smoky died of natural causes. The twin sisters (born Friedman) went on to pen the Dear Abby and Ann Landers advice columns, respectively. Phillips wrote Dear Abby under the name Abigail Van Buren. The competing columnists had a publicly rocky relationship, and while they reconciled briefly in the ‘60s, they were reportedly not speaking when Esther died in 2002. The painter was born and died in the same house, a building nicknamed “La Casa Azul” for its blue exterior. Kahlo was raised there, and years later, she and her husband, Mexican muralist Diego Rivera, made it their home as well. On July 13, 1954, Kahlo died there at age 47. The principal thing [an author] has to do is to write a good book. Then he has to send the manuscript to one publisher after another until he finds one who wants to publish it. I'm glad you liked 'Stuart Little' and 'Charlotte's Web' and thanks for writing. The author and naturalist was a total yogi. He was reportedly introduced to the practice through friend and fellow writer Ralph Waldo Emerson. One of his practices involved sitting cross-legged at the doorway of his cabin from sunrise to noon. Mandela is often credited as saying, “Our deepest fear is not that we are inadequate. Our deepest fear is that we are powerful beyond measure.” In fact, those are the words of spiritual teacher and author Marianne Williamson, from her 1992 book A Return to Love. It’s unclear how the misattribution began. Hemingway is known for being a master of economizing language, but that doesn’t mean he didn’t need to edit to get there. The author actually penned 47 endings to his classic World War I novel, A Farewell to Arms. Earhart’s ill-fated, twin-engine Lockheed Electra made a cameo in a 1936 film called Love on the Run, starring Clark Gable and Joan Crawford. It was shot eight months before the plane’s final flight over the Pacific Ocean but was only discovered on screen earlier this year. The author of The Tale of Peter Rabbit was a mushroom expert. She studied and drew fungi in staggering detail, even making an important discovery about how they reproduced by spores, completely reclassifying them as lichens. Still, when she tried to submit her findings to the Linnean Society of London in 1897, they turned her down, as women were not allowed to become members. Her gorgeous watercolors—more than 450 of them—can still be seen at the Armitt Museum in the United Kingdom today.